The world of satellite imagery can be difficult to navigate. Our goal is to simplify this for business users seeking valuable insight. Here, we explain how the commercial satellite imagery landscape works. 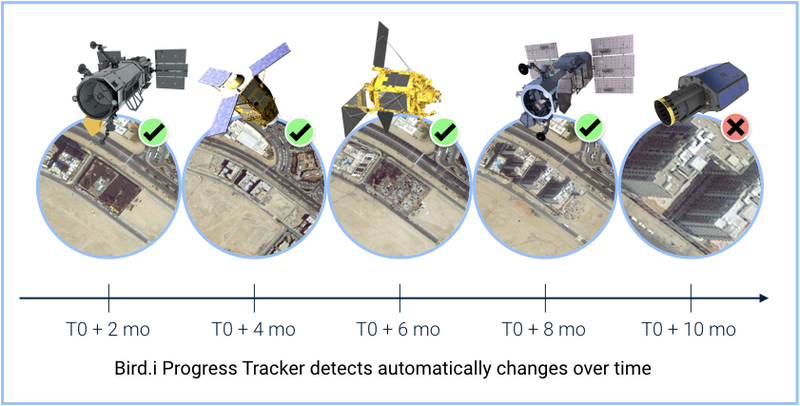 The majority of people were first exposed to satellite imagery in early 2000’s with the launch of GoogleEarth, the first public representation of Earth based on satellite imagery. Since then, there has been a huge increase in the number of similar mapping applications, opening up new opportunities for the consumption and analysis of satellite imagery. Thanks to major operators such as DigitalGlobe, Airbus and Planet, more satellites than ever are now observing our planet from space. Considering that collectively, these operators have the capacity to map every part of the world more than once a day, it’s no wonder that this imagery is deemed such a valuable data source. We believe this incredible data should be easily-accessible by everyone. We compile and integrate their collective data into our platform, to offer the most valuable satellite imagery available in one rich feed. This can be accessible via our Image Service. In addition, the latest technology advances in cloud infrastructure and artificial intelligence are being leveraged to extract unique insights at an unprecedented scale. Find out more about how Bird.i provides this insight via our Intelligence Service. 9 out of 10 businesses currently use free online mapping applications (such as Google Maps) to make important decisions. What these businesses don’t know is how obsolete this imagery can be. Free online mapping applications update imagery in-line with population density. As a result, images are updated, on average, every 6 months in populated areas and up to every 7 years in more remote locations. For businesses requiring the latest and best satellite imagery, a free service is unlikely to be the best solution. Many businesses are also unaware of the amount of up-to-date imagery that the current commercial Earth Observation satellite operators are capable of supplying. Accessing it however, remains a very difficult task with high commercial, contractual and technical barriers. 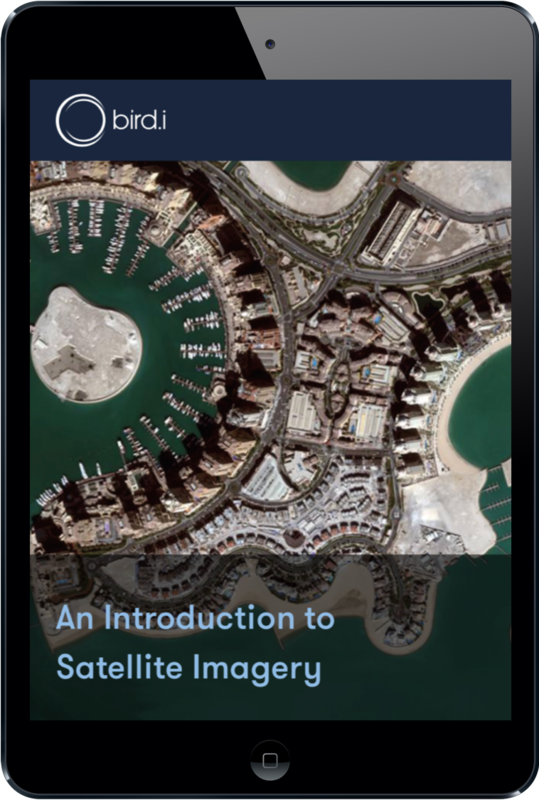 Our easy-to-use platform solves the challenge of accessing this satellite imagery by curating the best images from multiple commercial satellite providers into one place, our Image Service, via a user-friendly Portal or plug-and-play API. Although the physics behind satellite imagery could be perceived as “rocket science” (i.e. something very difficult to understand); from a user perspective, it could be simplified and summarised in two words: it’s all about Resolution and Revisit. – The Resolution is the level of details you can see on an image. For example, in an image with a one-meter resolution, each pixel represents 1 meter on the ground. – The Revisit is the time you have to wait between two images being acquired for the same location. For instance, a daily revisit lets you monitor fast developing phenomenon. From a satellite operator perspective, it means that either they have expensive and large satellites, usually in small numbers, with a large and sophisticated telescope acquiring very high resolution images (up to 30cm resolution for DigitalGlobe for instance); or they have smaller and cheaper satellites, hence in great numbers, with a small and simple telescope acquiring medium resolution images (between 3 to 5m resolution for Planet for instance). Because the revisit is primarily driven by the number of satellites orbiting our planet, it means that operators of few but large satellites have a low revisit (between monthly to quarterly) while operators of large constellations of small satellites have a high revisit (between weekly to daily). By combining images from a range of commercial satellite operators such as DigitalGlobe, Airbus and Planet, Bird.i offers the greatest spatio-temporal dataset, without compromising on the resolution or the revisit. 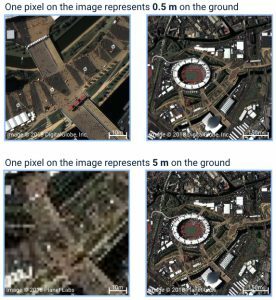 For example, the images above show the London Olympic Park at 0.5m and 5m resolution. How was it before that image? What does it look like today? How will it look tomorrow? These questions are very common and have been inspiring our Artificial Intelligence teams to develop smart processes which can learn from, and make predictions based upon, earth observation data. The aim of our AI work is to perform valuable analysis at scale, more precisely, and more quickly than with the trained human eye. To learn more about our intelligence services click here. If you have more questions about satellite imagery, why not check out our FAQs page or get in touch to see how data from satellite imagery can help solve your business challenges.